Region IV Chapter of the Year Award for 2001! 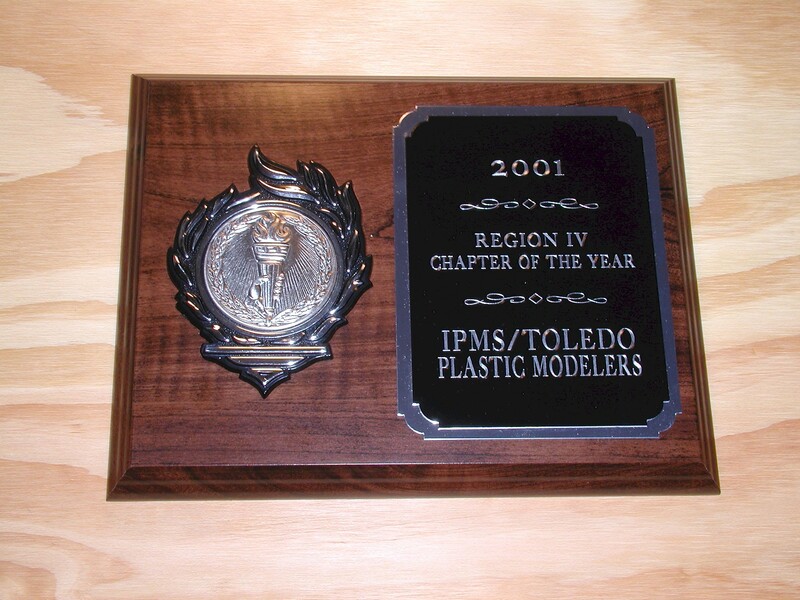 The Toledo Plastic Modelers chapter of the International Plastic Modelers Society (IPMS) was first chartered nearly thirty years ago. What follows is a brief history of our chapter, written by Don Skoluda. We are one of the oldest - if not the oldest - registered Chapters in Region IV. We were chartered in March of 1972, and have just celebrated our 30th Anniversary as a Chapter this year. While many clubs and Chapters have come and gone, we remain viable. We also are one of the few Chapters who continue to hold bimonthly meetings. During the summer months, we hold our meetings outdoors. Initially this was done out of necessity, as we lost the twice a month access to our regular meeting place, but our members like the change. We manage to incorporate a cookout into the summer meetings also and encourage family members to participate. Our Chapter held its first Region IV Convention in 1974. At the 1973 Regional, we became the first Chapter to announce contest categories, awards and a featured speaker for the next years Regional. We had flyers prepared and distributed well in advance of the contest. This really surprised a lot of people, set the standard for future Regionals, and made Toledo a Chapter to contend with! While on the subject of Regionals, let it also be noted we were the first Chapter to award plaques for contest trophies in place of the "winged victory"-style trophies used before. When you attend the National Convention or a contest of similar stature and see all the plaques ready to be awarded, remember: it all started in Toledo! Toledo was also the first Chapter to introduce the "Multi-Regional" contest concept to Region IV. This came about in answer to a ground swell in the mid-1970s for a less formal, one-day event. The idea was to conduct a small, informal contest without a guest speaker or a lengthy awards ceremony. This was held in the early fall months while travel was still feasible. We felt the idea would also attract those modelers who just couldnt pass up another contest! In a modified form, our Chapter still conducts a yearly event, our Toledo Annual Invitational model contest, which includes a swap meet. We cannot claim to be the first Chapter to hold a Regional at a local National Guard facility. That said, even before our 1996 Regional there, we enjoyed a long relationship with the local Air Guard unit. Our Chapter maintained a display case with modern jet aircraft featured at the 180th Fighter Group Headquarters for many years. Many unit members enjoyed the display and even requested models of particular aircraft to be built. One of our Chapter members built a model of an Ohio Medal of Honor-winners aircraft, which was presented to the Base Commander and is displayed in a new facility. The same builder also presented a 1/32nd scale F-16A to a Chief Master Sergeant when he retired from the Air Guard after 34 years service. Many members of Region IV still speak of our Regional Convention, held in 1996 at the Air Guard facility, as having been one of the best Regionals in many years. Combined with the open house that the unit was also conducting, the hot, humid Saturday was as close to an air show as any Regional could have been! While the judges went over the models with a fine-tooth comb, the F-16s entertained the crowd with full-afterburner takeoffs! There were also static displays of planes from other units. Not to be outdone, the local Army Guard contributed some modern Army vehicles for the "tread heads" to look over. Our contests have been well received among Region IV attendees. So much so, we were invited to help our "sister" IPMS Chapter, the Fremont KitBashers, conduct their first contest last year. We helped them decide on categories, select awards, and most importantly, provided extra manpower to help them set up the contest. The Kitbashers also chose to include a swap meet at this contest. Although the specter of 911 hung over this occasion, the event was successful. Our Chapter continues to support and encourage the Fremont group. Toledo IPMS has also conducted Make N Take seminars at our Annual Invitational contest, and on two other occasions at local hobby shops. All of these seminars attracted numerous participants. Our members realize we must reach out to the next generation to enable our hobby to continue. While we no longer have displays at the local malls due to liability issues, we have managed to use the Make N Take program to expose our Chapter to potential new members. A constant search for new members led us to extend an invitation to the Maumee Valley Model Boat Club to display their works at our last swap meet. The wonderful collection of large-scale ships they brought helped attract public attention to the contest. Our location on one of the Great Lakes insures a fascination with ships by many Toledo residents. The presence of the MVMBC helped reduce a public perception that IPMS contests are strictly oriented toward military subjects. In that regard, our Toledo Annual Invitational contest and swap meet also garners many non-mainstream subjects. Encouraged by the Black Swamp Modelers Special Interest Group within our Chapter, we get an excellent turnout every year by vehicle and figure modelers who build in the Sci-Fi, Fantasy, and Horror genres. The BSM folks enter models of a level of workmanship that even die-hard aircraft and armor guys can appreciate. Where else in Region IV could you see a herd of Godzillas entered in the Collections category along with US Medium Tanks and T-28 Trainers? Over the past 30 years IPMS/Toledo Plastic Modelers has had many firsts to which we can lay claim. We are one of the oldest Chapters in Region IV, with some of our original members still active in Chapter affairs. We set many standards for contests in Region IV, most of which continue to be used today. Our Regionals are the ones modelers mention most frequently: "Remember when you guys had the Regional at the Air Guard? ", is a common greeting when our members visit other Chapters. Our Chapter continues to grow and thrive at a time when many organizations are losing members. We constantly try to promote plastic modeling and the enjoyment of all sides of the hobby. To this end, we have published this web site. This new resource helps to promote our Chapter by provide information about its activities. Even more, we maintain a calendar of events of other IPMS groups, as well as a series of links to hobby-related web sites. The Toledo Plastic Modelers will continue to host the Toledo Annual Invitational. IPMS Toledo has a long history of being "small but mighty"!